The term organic fertilizer simply doesn't do justice to Perfekt Earth. This amazing organic soil supplement sparks a revolution in top soil by replenishing it with the essential minerals and nutrients it has lost over time. If you practice green gardening or organic farming you'll be amazed as you watch natural soil begin to produce larger, healthier, better tasting produce and abundantly beautiful plants. A little Perfekt Earth goes a long way. Learn how to prepare and condition your soil using this soil conditioner. Perfekt Earth Soil enhancing formula is perfect for building and restoring your soil. 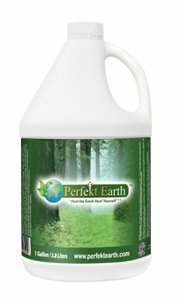 Super-concentrated Perfekt Earth is packed with nature's blend of ionic minerals, trace minerals, and a mix of special organic components that give your soil a kick start in a very natural way to build soil teaming with life. Healthy soil means healthy plants, healthy animals, and healthy people. Use it to prepare soil in fall or spring, further enliven your soil and plants throughout the growing season with very dilute booster applications. Flowers, Fruits, Ornamentals, Vegetables, Shrubs, Trees and Grass all come alive with perfekt earth. See the difference, smell the difference, taste the difference. Use it on your compost and watch the process accelerate with much greater potency. Lay the foundation for richer more fertile soil and reap the benefits year after year as you work with nature adding along the way. Perfekt Earth is an all natural, organic soil enhancer that introduces natural nutrients and micro nutrients into the soil. Many yards and gardens suffer from a lack of good healthy top soil. Many farms are dealing with depleted or sterile soil due to overuse of commercial fertilizers, pesticides and herbicides. Perfekt Earth is naturally balanced to produce optimum conditions to rebuild your soil and support healthy plant life. Healthy plants are the key to healthy animals and humans alike. The better your soil, the better your results. Perfekt Earth can help you. Typically you will notice increased plant vitality in days. What do others have to say about Perfekt Earth? Soil Preparation. Apply the solution to the treatment area. Till or rake the soil to work the solution into the first few inches of soil prior to planting. We recommend a 50:1 dilution of the product. Soil Conditioning. For areas where plants are already in place, we recommend the solution be applied up to 4x/year and soaked into the soil around the plants. Recommended dilution is 200:1. Bi-weekly Booster. Plants can be watered regularly with Perfekt Earth to continue the supply of minerals to the soil and plants. Add the solution to your watering schedule every other week.Recommended dilution is 800:1. Weekly Booster. If you choose to use the solution on a weekly basis we recommend a 1600:1 dilution.